This tutorial should give you a quick introduction to the MapProxy configuration. You should have a working MapProxy installation, if you want to follow this tutorial. The configuration of MapProxy uses the YAML format. YAML is a superset of JSON. That means every valid JSON is also valid YAML. MapProxy uses no advanced features of YAML, so you could even use JSON. YAML uses a more readable and user-friendly syntax. We encourage you to use it. If you are familiar with YAML you can skip to the next section. The YAML configuration consist of comments, dictionaries, lists, strings, numbers and booleans. Everything after a hash character (#) is a comment and will be ignored. Any numerical value like 12, -4, 0, and 3.1415. A string with spaces and punctuation. A dictionary maps keys to values. Values itself can be any valid object. You can also nest dictionaries. Each nested dictionary needs to be indented by one or more whitespaces. Tabs are not permitted and all keys to the same dictionary need to be indented by the same amount of spaces. of multiple sources and caches. that are used in the other configuration directives. The order of the directives is not important, so you can organize it your way. Each service is a YAML dictionary, with the service type as the key. The dictionary can be empty, but you need to add the colon so that the configuration parser knows it’s a dictionary. A service might accept more configuration options. The WMS service, for example, takes a dictionary with metadata. This data is used in the capabilities documents. abstract: This is the fantastic MapProxy. access_constraints demonstrates how you can write a string over multiple lines, just indent every line the same way as the first. And remember, YAML does not accept tab characters, you must use space. In this example test_wms is the name of the source, you need this name later to reference it. Most sources take more parameters – some are optional, some are required. The type wms requires the req parameter that describes the WMS request. You need to define at least a URL and the layer names, but you can add more options like transparent or format . After defining a source we can use it to create a layer for the MapProxy WMS. 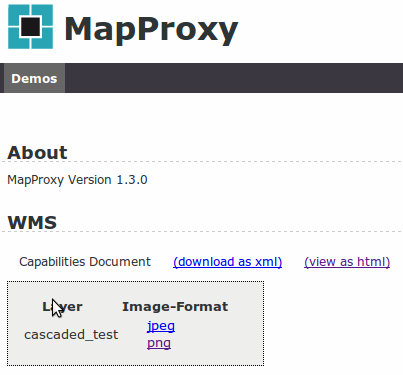 Now we have setuped MapProxy as cascading WMS. That means MapProxy only redirect requests to the WMS defined in test_wms data source. You can download the configuration. When you type localhost:8080/demo/ in the URL of your webbrowser you should see a demo site like shown below. Here you can see the capabilities of your configured service and watch it in action. To speed up the source with MapProxy we create a cache for this source. Each cache needs to know where it can get new data and how it should be cached. We define our test_wms as source for the cache. MapProxy splits images in small tiles and these tiles will be aligned to a grid. It also caches images in different resolutions, like an image pyramid. You can define this image pyramid in detail but we start with one of the default grid definitions of MapProxy. GLOBAL_GEODETIC defines a grid that covers the whole world. It uses EPSG:4326 as the spatial reference system and aligns with the default grid and resolutions that OpenLayers uses. We can now use our defined cache as source for a layer. When the layer is requested by a client, MapProxy looks in the cache for the requested data and only if it hasn’t cached the data yet, it requests the test_wms data source. By default MapProxy caches traditional power-of-two image pyramids with a default number of cached resolutions of 20. The resolutions between each pyramid level doubles. If you want to change this, you can do so by defining your own grid. Fortunately MapProxy grids provied the ability to inherit from an other grid. We let our grid inherit from the previously used GLOBAL_GEODETIC grid and add five fixed resolutions to it. As you see, we used base to inherit from GLOBAL_GEODETIC and res to define our preferred resolutions. The resolutions are always in the unit of the SRS, in this case in degree per pixel. You can use the MapProxy scales util to convert between scales and resolutions. Instead of defining fixed resolutions, we can also define a factor that is used to calculate the resolutions. The default value of this factor is 2, but you can set it to each value you want. Just change res with res_factor and add your preferred factor after it. A magical value of res_factor is sqrt2, the square root of two. It doubles the number of cached resolutions, so you have 40 instead of 20 available resolutions. Every second resolution is identical to the power-of-two resolutions, so you can use this layer not only in classic WMS clients with free zomming, but also in tile-based clients like OpenLayers which only request in these resolutions. Look at the configuration examples for vector data for more information. In the previous section we saw how to extend a grid to provide self defined resolutions, but sometimes GLOBAL_GEODETIC grid is not useful because it covers the whole world and we want only a part of it. So let’s see how to define our own grid. For this example we define a grid for Germany. We need a spatial reference system ( srs ) that match the region of Germany and a bounding box ( bbox ) around Germany to limit the requestable aera. To make the specification of the bbox a little bit easier, we put the bbox_srs parameter to the grid configuration. So we can define the bbox in EPSG:4326. We have to replace GLOBAL_GEODETIC in the cache configuration with our germany grid. After that MapProxy caches all data in UTM32. MapProxy request the source in the projection of the grid. You can configure the supported SRS for each WMS source and MapProxy takes care of any transformations if the srs of our grid is different from the data source. If you have two WMS and want to offer a single layer with data from both server, you can combine these in one cache. MapProxy will combine the images before it stores the tiles on disk. The sources should be defined from bottom to top and all sources except the bottom need to be transparent. As you see notation of a coverage bounding box is similar to the notation in the grid option. When you have experience with WMS in tiled clients you should know the problem of labeling issues. MapProxy can help to resolve these issues with two methods called Meta Tiling and Meta Buffering. There is a chapter on WMS labeling issues that discusses these options. MapProxy creates all tiles on demand. That means, only tiles requested once are cached. Fortunately MapProxy comes with a command line script for pre-generating all required tiles called mapproxy-seed. It has its own configuration file called seed.yaml and a couple of options. We now create a config file for mapproxy-seed. As all MapProxy configuration files it’s notated in YAML. The mandatory option is seeds. Here you can create multiple seeding tasks that define what should be seeded. You can specify a list of caches for seeding with caches . The cache names should match the names in your MapProxy configuration. If you have specified multiple grids for one cache in your MapProxy configuration, you can select these caches to seed. They must also comply with the caches in your MapProxy configuration. Furthermore you can limit the levels that should be seeded. If you want to seed only a limited area, you can use the coverages option. In the example below, we configure mapproxy-seed to seed our previously created cache test_wms_cache from level 6 to level 16. To show a different possibility to define a coverage, we use a polygon file to determine the area we want to seed. As you see in the coverages section the polygons option point to a text file. This text file contains polygons in Well-Known-Text (WKT) form. The third option tells mapproxy-seed the srs of the WKT polygons. You can download the configuration and the polygon file. Now it’s time to start seeding. mapproxy-seed has a couple of options. We have to use options -s to define our seed.yaml and -f for our MapProxy configuration file. We also use the --dry-run option to see what MapProxy would do, without making any actual requests to our sources. A mis-configured seeding can take days or weeks, so you should keep an eye on the tile numbers the dry-run prints out. If you sure, that seeding works right, remove --dry-run. You should read the configuration examples to get a few more ideas what MapProxy can do. MapProxy has lots of small features that might be useful for your projects, so it is a good idea to read the other chapters of the documentation after that. If you have any questions? We have a mailing list and IRC channel where you can get support.